He Is No Fool Who Gives Up What He Cannot Keep, To Gain That Which He Cannot Lose! To Gain That Which He Cannot Lose! My friend, you cannot keep anything materialistic in this world. That big home that you pour your life's earnings into will be left to someone else when you die. That nice car that you buy will become a bucket of rust in a few decades, if not sooner. Your clothes, no matter how expensive or nice, will wear old and have holes in them over time. Your shoes, no matter how expensive, will wear old with holes in the sole. Nothing in this world lasts. Everything that we own is just temporarily in our possession. It was missionary Jim Elliot (1927-1956) who was savagely murdered by the Ecuadorian natives when he tried to witness the Gospel to them. Five missionaries total were martyred. Jim Elliot gave the ultimate sacrifice for Christ, losing his very life. Elliot is most famous for his quote, “He Is No Fool Who Gives What He Cannot Keep, To Gain That Which He Cannot Lose!” Jim Elliot was willing to take risks to sow the seed of the Gospel in obedience to The Great Commission (Matthew 28:19-20) Are we? The most foolish thing you'll ever do is lay up earthly wealth. You may die before you spend a penny of it. In fact, that's what often happens!!! $58,000,000,000 are sitting dormant and unclaimed in millions of government retirement accounts . . . Currently, states, federal agencies and other organizations collectively hold more than $58 billion in unclaimed cash and benefits. That's roughly $186 for every U.S. resident. The unclaimed property comes from a variety of sources, including abandoned bank accounts and stock holdings, unclaimed life insurance payouts and forgotten pension benefits. Some people are owed serious cash. Last year, a Connecticut resident claimed $32.8 million, proceeds from the sale of nearly 1.3 million shares of stock. The recipient of the funds requested to remain anonymous and no further details were provided. More than $300 million in pension benefits is currently owed to some 38,000 people, according to the Pension Benefit Guaranty Corp. The unclaimed benefits currently range from 12 cents to a whopping $704,621, with an average benefit of $9,100. Benefits may go unclaimed because an employee is unaware they had accrued retirement benefits at a previous employer, the agency said. Forgotten cash? Do you really think that all those millions of people “FORGOT” about their money? No, of course not, THEY DIED! I'd rather spend my life giving to THE POOR (not necessarily the less fortunate). You've got so-called “poor” people all across America who have color TV, video games and always have a pack of cigarettes on them. They are not truly poor. When you don't know where your next meal is coming from, you're poor. Dr. Jack Hyles (1926-2001) was poor when he grew up in west Texas during The Great Depression. His mother used to send him to the butcher to ask for a soup-bone for the dog. The butcher knew that they were poor and would regularly give them a soup-bone with a little extra meat on it, and then his mother would prepare dinner for them with that soup-bone. One day during The Great Depression, as the young boy Jack Hyles walked beside his mother along the train tracks in Italy, Texas, they found some wild grown collard greens. His mother rejoiced, because she had found their dinner. Dr. Hyles didn't have a bicycle until his sister got a job and bought him one when he was age 13. He didn't eat an egg, use a flushable toilet or eat a hamburger until he turned 15. That's poverty! Brother Hyles' childhood poverty was the driving force behind his passion to send hundreds of church buses every Sunday for decades throughout the Chicagoland area to reach poor boys and girls for the Lord Jesus Christ. Today's spoiled Americans think they're poor if they can't afford a second car or a pair of expensive Jordan sneakers. Do you want to hear some really tragic statistics? It makes me cry. It was reported this week by TIME magazine that Americans spend $56,000,000,000 each year on their pets. $56 BILLION A YEAR!!! The cost to support a missionary and his family is $50,000 a year. For $56,000,000,000 a year Americans could send out and support 1,200,000 Christian missionaries with that money we spend on some stupid animals (sorry, I mean beloved pets). Americans spend another $25,000,000,000 on video games. They spend another $54,000,000,000 on gambling. They spend another $50,000,000,000 on internet fornication and adultery. Americans spend $90,000,000,000 each year on booze. They spend another $8,000,000,000 on cigarettes. Americans have plenty of money to spend on all the wrong things. God only rewards you if you give to the genuinely poor who cannot return anything to you. Homeless people on the street are poor. Fatherless children and elderly widows are often poor. People surviving in third-world countries like the Philippines and Africa are poor. When we give to THE POOR, we are lending to the Lord and He has promised to return it to us . . . In fact, Jesus promised to return our investment for His sake and the gospel's AN HUNDREDFOLD (10,000%) . . .
Notice that the Bible plainly says you must give FOR JESUS' SAKE AND THE GOSPEL'S. Oprah Winfrey is continually praised by the Godless mainstream newsmedia as one of the most generous celebrities in the world. She has been exalted by the wicked newsmedia as being amongst the top 50 most generous people in the world. WHAT A PATHETIC JOKE!!! Oprah has reportedly given away hundreds-of-millions of dollars to worldly organizations and a school that helps 150 students in Africa. What a joke! Do you know what Oprah Winfrey's net worth is? Oprah's net worth is a whopping $2,700,000,000!!! That's $2.7 BILLION DOLLARS!!! My friend, you are only as generous as WHAT YOU KEEP FOR YOURSELF!!! May I say, kindly, that Oprah Winfrey is very SELFISH!!! She has reportedly given millions, but she keeps BILLIONS!!! And may I also say, Oprah Winfrey has never given a single penny in the precious name of the Lord Jesus Christ. A dime given in Jesus' name to a gospel preaching missionary will reap more eternal rewards than giving a billion dollars in one's own name!!! Oprah, Oprah, Oprah... Oh shut up!!! As mentioned earlier, Martyred missionary Jim Elliot is most famous for his quote, “He Is No Fool Who Gives What He Cannot Keep, To Gain That Which He Cannot Lose!” In sharp contrast to Elliot, Oprah keeps what she cannot give so she can gain what she never gave! Jesus said to “SELL THAT YE HAVE” (Luke 12:33-34) and give alms (help to the poor). We will never truly know what it means to be generous until we make the sacrifice to part with our possessions, and sacrificially give to OTHERS who are poor. When Jesus commanded us to SELL THAT YE HAVE, He was teaching us as His disciples to GIVE SACRIFICIALLY. The truth hurts doesn't it? When you as a Christian give to the poor and support missionaries who work with the poor in Jesus' name, you are lending to the Lord. It is far better, from Heaven's perspective, to lay up treasures in Heaven by donating to missionary work! You're going to spend your life's work, investing from paycheck-to-paycheck, laying up earthly wealth, just to lose it all in an ugly divorce 10-20 years down the road, or to have inflation deteriorate your spending power, or lose it all to greedy lawyers if you end up in court for any reason, or have the government steal it when you die (they'll never search for your family to inherit the money). They are all thieves! In all likelihood you are laying up treasures for the government, which makes you a fool. Don't be a fool, give now, little-by-little, to support the sowing of the gospel and the helping of the poor. 1900 church buildings were recently destroyed in the Philippines in late 2013, because of a monstrous tsunami produced by super typhoon Haiyan. 700,000 people lost their homes in the path of destruction, totally devastated. Countless thousands of people are dead, and many still missing. You can give to help Independent Fundamental Baptist Missionaries rebuild churches and lives in the Philippines. We should all help them financially . . .
BIMI is King James Bible only! Amen! This life will soon be over. I'm not saying that we shouldn't plan for some kind of earthly retirement, but I am saying that only a fool invests every penny he has into a retirement that he and his spouse may never live to see. Jesus said that the unsaved world WORRIES ABOUT TOMORROW'S PROVISIONS . . . I know I'm going to make enemies here, but that's ok, I know God is pleased with what I am preaching. I think we should be careful which missionaries (through missionary boards) that we support. I like IBM Global (International Baptist Missions Global), except their Statement of Faith claims that only the original manuscripts are inspired, which means they don't believe that we have a perfect English Bible today. I have a real problem with that, and so should you if you love Jesus!!! Do we not have a perfect Bible? Do I want to support a missionary who doesn't believe that the holy Bible he holds in his hand is without errors? God used 53 scholars to give us our present-day authorized King James Bible. IT IS WITHOUT ERROR! Let all the Bible-correcting preachers keep correcting, but I FIND NO FAULT IN THE WORD OF GOD. Is not the omnipotent God of the universe able to give us a Bible without errors? I have the perfect, preserved, inspired, Word of God in the 1611 King James Bible. Believe Jesus is the authority over you. Believe that Jesus raised from the dead. No mention of sin? No, he never mentioned sin. No mention of the cross? No, he never mentioned the cross. This is a false gospel. At least he didn't tell people to stop living in sin to be saved, as Lordship Salvationists do. Yet, he also added to the gospel by requiring people to recognize Christ's authority to be saved. It is obvious that he believes Lordship Salvation. You cannot show me that from the Bible. Saul's (Paul's) spectacular conversion was NOT a pattern for salvation for every man. It was a unique experience. Saul was saved by repenting and believing the gospel, and not because he immediately surrendered to Christ's Lordship. God had been convicting Saul's heart for a long time, while Saul was wasting the Church of God and murdering Christians, which is why Saul immediately surrendered to serve God as he did. However, this is NOT the norm (nor should it be) for most people who get saved. By “repenting” I simply mean “a change of mind” as the Bible teaches. This is how the thief on the cross also was saved. I won't mention the name of the missionary who gave the preceding lame presentation of how to be saved, because I do believe he is a true Christian, just not informed. I'm sending him Dr. Hyles' sermon titled . . . Famous author C.S. Lewis once referred to the various presentations of the gospel as “formulas.” May I say, there are no “formulas” concerning the gospel. You come as a guilty sinner (Romans 3:19) and then believe on the Savior Who died, was buried and resurrected from the dead after three days (i.e., the Gospel, 1st Corinthians 15:1-4). This is exactly what Galatians 3:24-25 teaches, that is, the LAW shows us our SINNERSHIP and then POINTS US to the SAVIOR for forgiveness through the cross and His blood sacrifice. Amen! We must not ADD nor SUBTRACT from the gospel. We are saved by grace alone, through faith alone, in Christ alone, plus or minus NOTHING! If a preacher leaves off the matter of sin, then he has subtracted from the gospel. 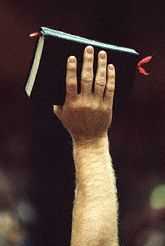 If a preacher requires a person to forsake sinful bad habits, then he has added to the Scriptures. If the cross is left off upon which Christ died, then something is missing. The gospel is that Jesus died on the cross, was buried and then miraculously raised up three days later. What happened that all these people didn't enjoy their laid up earthly treasures? Most either died or are too sick to do anything with the money. Remember this news article the next time that your retirement company tries to convince you to leave your money invested. Of course they want you to leave the money invested, so they can steal it from you. We are living in a world of thieves and scoundrels. The elderly in particular are taken advantage of. I recall a situation years ago where an elderly man deposited $5,000 into his local bank (so he thought). The bank employee didn't submit the paperwork and kept the paperwork on the side, waiting for the elderly man to die so that wicked employee could steal the money. The elderly are primary targets for con-artists, thieves and the wicked. Jesus was fully aware of how the Scribes, Pharisees and lawyers of His time stole widow's houses (Matthew 23:14). The wicked Scribes were similar to legislatures today who set the law, and the Pharisees the judges who enforce the law, and the lawyers who manipulate the law, all to steal money from their victims! As mentioned earlier, it was missionary Jim Elliot (1927-1956) who was savagely murdered by the Ecuadorian natives when he tried to witness the gospel to them. Five missionaries total were martyred. Jim Elliot gave the ultimate sacrifice for Christ, losing his very life. Elliot is most famous for his quote, “He Is No Fool Who Gives What He Cannot Keep, To Gain That Which He Cannot Lose!” Jim Elliot was willing to take risks to sow the seed of the gospel in obedience to The Great Commission (Matthew 28:19-20) Are we? Many Christian believers think they are being persecuted if someone laughs at a bumper sticker on their car. Most people don't know what persecution is. Last week North Korean dictator, Kim Jong-un, ordered 33 church planting Christian Baptist missionaries to death! If you search the alternative newsmedia and foreign news press, you'll discover that Christians around the world are martyred regularly. The American lying mainstream newsmedia wont tell us the truth. Look around you and realize that everything you see is only temporal. Your earthly treasures that have been laid up for your old age will rot. Wealth is a curse the Bible says . . . THIS WORLD AND EVERYTHING IN IT WILL SOON PASS AWAY . . .